If you want your business or organization to be a standout, you have to stand out. Even if you don’t have a physical product to sell, make sure your website and print materials reflect your style and values. Siena Farms is a fifty-acre farm in Sudbury, Mass. that grows produce for farmers markets, restaurants, and a 750-member CSA. 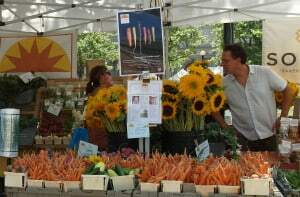 Siena Farms does a wonderful job at making their stall at the Copley Square Farmers Market in Boston visually enticing. For one thing, their products are gorgeous. They grow many unusual varieties and the colors, textures and shapes of their produce are bold, beautiful and sensuous. They even make boxes of nobby carrots look tasty. And the vegetables are artfully arranged in loose piles or standing upright in wooden boxes, baskets, and metal pails. Their displays are so distinctive that I would know I was at the Siena Farms stall even if they moved the location and took away the signs. 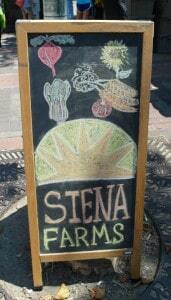 The Siena Farms logo is also a winner. A bright orange sunburst on top of a yellow-orange half circle, the colors evoke all my favorite fall vegetables. The image reproduces well and is used on their labels, banners, signage, and t-shirts. Each product has a little sign with the logo, the product name, a brief hand-lettered description, and–most importantly–the price. 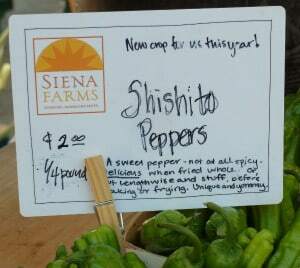 Although Siena Farms’ prices tend to be high, I’m willing to pay for the quality and the experience. I leave there feeling like I’ve just tucked a bit of Tuscany in my bag. A simple sign can set the tone for your business. Cucurbit Farm in Acton, Mass. is set in a residential neighborhood and the town limits the type of signage they can use, but Cucurbit has created a wonderful workaround. 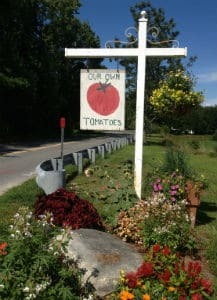 Cucurbit is famous for their award-winning tomatoes. This hand-painted sign, landscaped with beautiful flowers (also for sale at their farm stand), makes you want to stop and shop. When Starbucks Coffee launched their new logo, they took their name off of it because they’d established such a strong visual image that the name was no longer needed. Given how fanatic Starbucks is about branding, somebody sure messed up here. Take a really close look at this photo, recently shot in downtown Boston. Right. That’s a Mr. Coffee box sitting there! What’s your guess about who left it there? 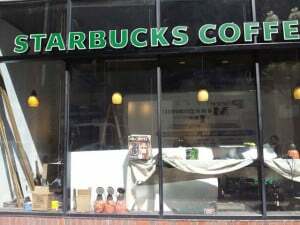 Someone at Starbucks should be paying attention to how their storefront looks, even during construction. Dunkin’ Donuts must be having a good laugh. Take a look at your business or organization’s images and displays. Do they dazzle? Are they distinctive? Do they fit with your brand? If not, try looking for inspiration at your local farmers market or farm stand. Previous Previous post: Does Your Logo Tell a Story?